With the increased interest in making REAL homemade bone broths, I’ve noticed the price of bones rising in recent years. The beef bones in my local health food store are no longer the steal they were a few years ago. And of course, pastured chicken isn’t cheap either. 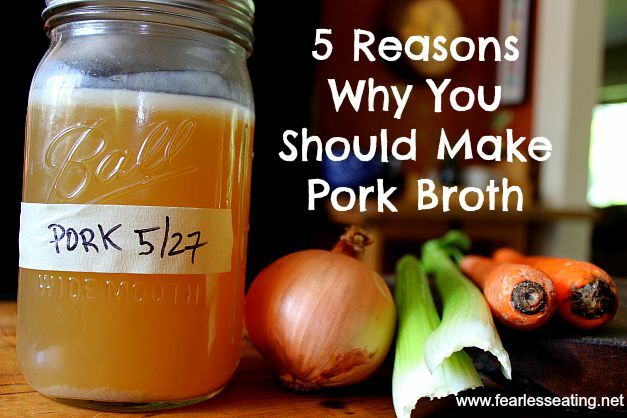 And that’s the first reason you should consider making pork broth! 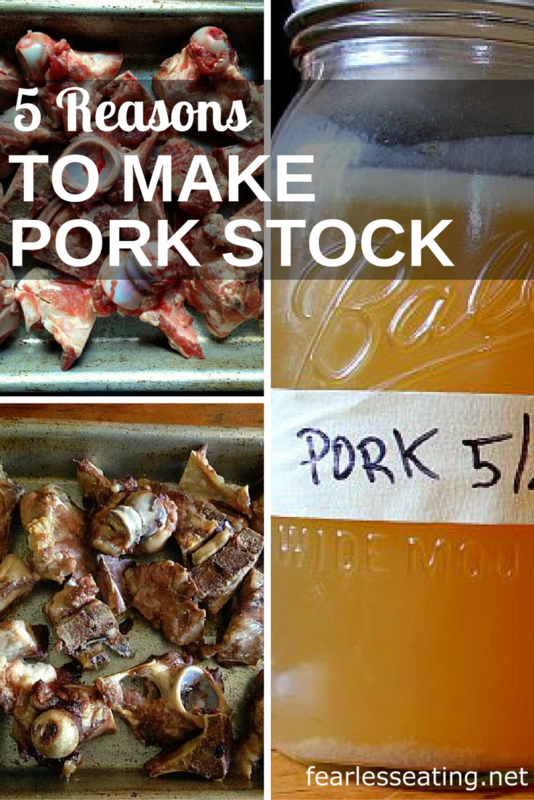 Hardly anyone makes pork broth anymore! For that reason, pork bones are often considerably cheaper than other types of bones (with the exception of fish bones). In fact, it can be difficult to even find pork bones for sale in supermarkets. They’re rarely on display. However, if you ask your local butcher they’ll probably be happy to give you some at a very reasonable price. If you’ve made a chicken broth, well, you know how to make pork broth. The process is just about the same. Roasting will develop more flavor. You can always skip this step if you’re short on time. Needless to say, Lipton was not happy when I told her that I forgot to save a few raw pork bones for her (but I made it up to her by making some homemade dog treats from the scraps of the broth). Next, place the bones in a 8-12 quart stock pot, add in the vegetables, cover the bones with water and bring it to a boil. Skim the scum that forms on the surface for a few minutes and then reduce the heat to a very gentle simmer for 4-24 hours. Strain the broth and transfer to storage containers. Broth purists and trained chefs will surely disagree with that statement. But I’m neither and most people I know aren’t either. In my experience, they’re not that different AND they’re totally interchangeable. If I’m making a recipe that calls for chicken broth but all I have is pork broth, I’ll use it instead and vice versa. 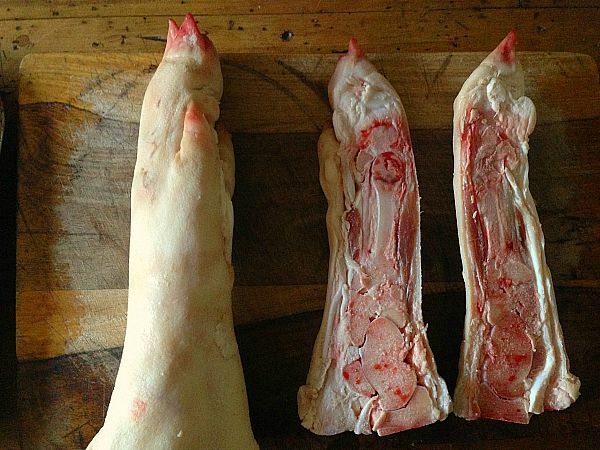 I picked those feet up from my local butcher for just a few bucks each. Look at all the collagen in there! Collagen is the strong but pliable connective tissues that keeps animals (including us) glued together such as tendons, ligaments, cartilage, joints and skin. And when you simmer all that in a broth, it breaks down into gelatin. 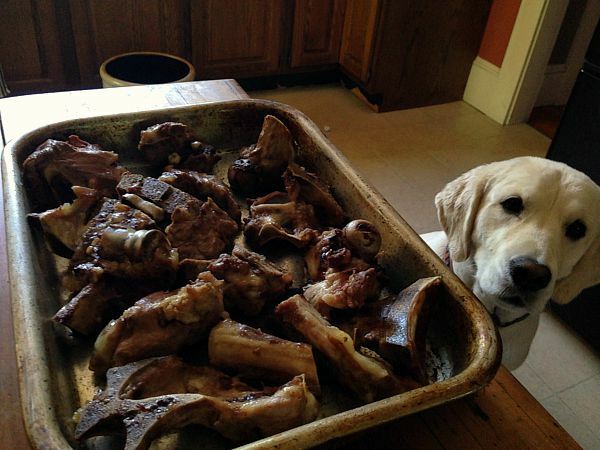 That’s why we want to use not just bones but other collagen-rich animal parts in a good homemade bone broth. The more gelatin, the more nutrients. Store-bought broths will NEVER contain gelatin. Check out the preview video for my new course, How to Make Bone Broth 101, and fast forward to the last clip. That’s the gelatin from a pork broth. Of the 5 different types of broths I show people how to make in this course, the pork broth was the most gelatinous…by far. My course, How to Make Bone Broth 101 will show you in detail how to make pork broth, as well as 4 other basic bone broths. 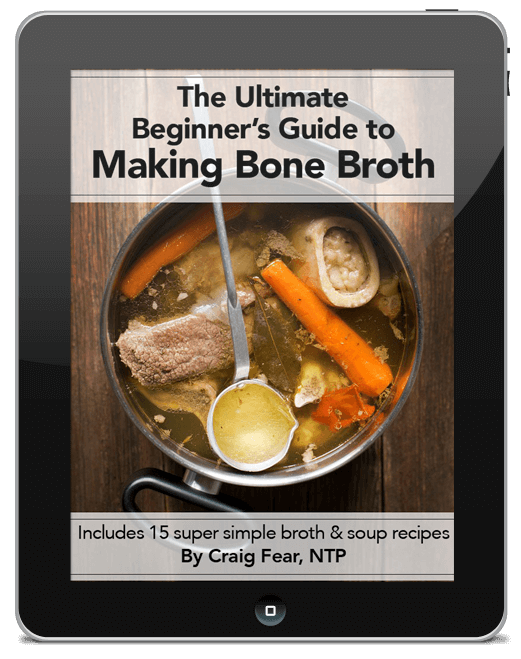 Now I know a course for something as simple as making bone broth may seem strange, but in my experience as a Nutritional Therapist, when I ask my clients to start making them at home, they have SO. MANY. QUESTIONS. 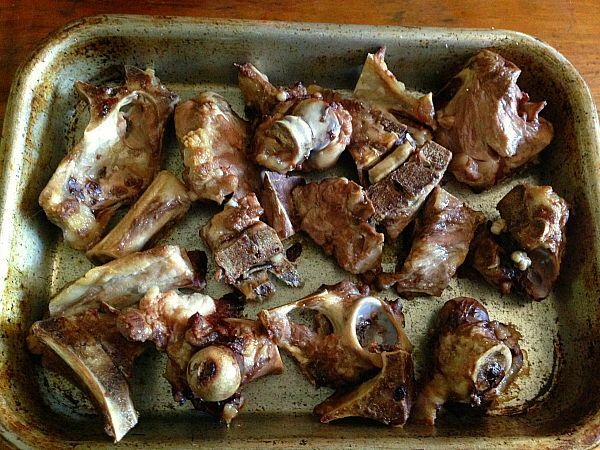 If you’re my age (41…gulp) or younger, it’s HIGHLY UNLIKELY your mother made real bone broths. If she used them at all it was almost certainly from a box, a can or god forbid, a bouillon cube. 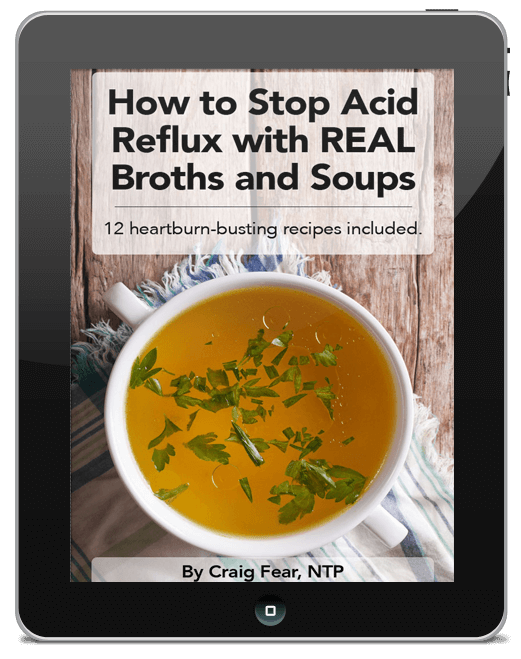 Well thanks to the real food movement, millions of people are finally getting it – store-bought broths are NOT real broths. They are full of chemicals (even the organic ones) that mimic the flavor of real bone broth. And so many people now want to learn to do it the RIGHT way. That’s why I created this simple course! It’s for all you bone broth-making newbies out there. No, it’s not complicated to make broths, but if you’ve never made them, it can be so very helpful to have some short, guided videos to get you going. In five simple videos you’ll learn to make the five most basic bone broths at home – chicken, beef, fish, pork and a leftover bones broth – the way your grandmother (or maybe great-grandmother!) used to do it. And in a very short time, I’m very confident you’ll go from a broth-making newbie to a broth-making expert. And for that reason, similar to buying pork bones, this course is very affordable. 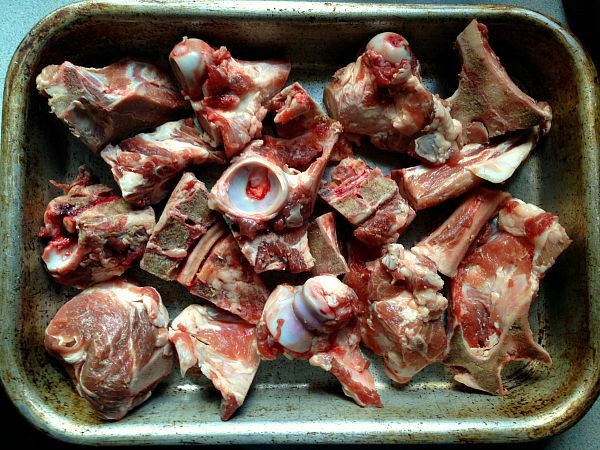 Learn more about How to Make Bone Broth 101 right here.